I just got an US visa. I’ll come to New York to compete in the World Championship. But I’m not in Russian national team (because Johnny Benidze…) that’s why I’ll compete among amateurs with kettlebells 24 kg. I didn’t compete with 24 kg 8 years. But I’m getting ready to do it this time. I’ll back to USA in November – we with another members of International department of RGSF will do seminar in Austin (Texas). This entry was posted on Friday, September 9th, 2011 at 7:51 pm	and is filed under Uncategorized. You can follow any responses to this entry through the RSS 2.0 feed. You can leave a response, or trackback from your own site. 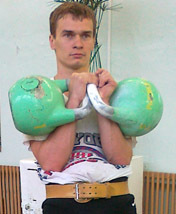 Online Kettlebell Coach (c) V. Egorov - Entries (RSS) and Comments (RSS).